(L-R): Glen Dudevoir (U.S. Air Force Academy), John James (U.S. Military Academy), Daniel Opila (U.S. Naval Academy), Edward Shaffer (U.S. Army Research Laboratory), Katherine Duncan (U.S. Military Academy) and Vivek Singh (Ph.D. student at Iowa State University). This photo was taken during a research meeting at the U.S. Air Force Academy, Colorado. Vivek Singh, a Ph.D. student with Iowa State University’s Department of Electrical and Computer Engineering (ECpE), recently received the U.S. Army Research Laboratory (ARL) Journeyman Fellowship Award. From September 2017 to January 2018, Singh completed an internship through the ARL Research Associated Program (RAP), working on a joint team project, including researchers from Idaho National Laboratory, the United States Military Academy, the United States Naval Academy, the United States Air Force Academy and the ARL. “It feels great to receive such a glorious award,” Singh said. Singh’s project responsibilities included developing a cyber physical testbed for the smart grid and proposing an Anomaly/Intrusion Detection Engine for detecting the possible attacks and providing appropriate mitigation in real time with a motive to develop the attack resilient system. Singh worked under the supervision of Edward Shaffer, chief of the energy and power division at the ARL, for the duration of his internship. “During the [internship], my adviser introduced me to the ARL testbed, which only had the real-time simulator, and I worked with ARL lab employees to buy and install new software and tools, which were necessary to develop the cyber physical testbed,” Singh said. On Iowa State’s campus in Ames, Singh works as a research assistant in the PowerCyber Laboratory with ECpE Mehl Professor and Associate Chair Manimaran Govindarasu. 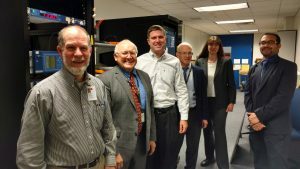 The goal of the PowerCyber Lab is to protect the cybersecurity of the electric power grid. Govindarasu spoke of Singh’s work and the bigger picture of his internship. Since his return to Coover Hall, Singh has been implementing his newly learned skills in this research but also in his life outside of the lab. He is grateful for the support of his mentors. “I would like to thank the ARL and associated colleagues, especially Dr. Edward Shaffer and Don Porschet, for assisting me with the resources and providing work-related feedback,” Singh said. He also thanks Govindarasu, along with ECpE Professors Venkataramana Ajjarapu and Ian Dobson for their support.